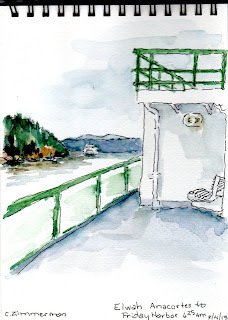 We spent a fabulous 4th of July weekend up on San Juan Island arriving on the 6:25am Elwah from Anacortes. Sketch done after crossing Rosario Straits. 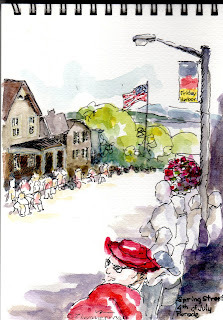 We arrived in time for the annual 4th of July parade down Spring Street in Friday Harbor. 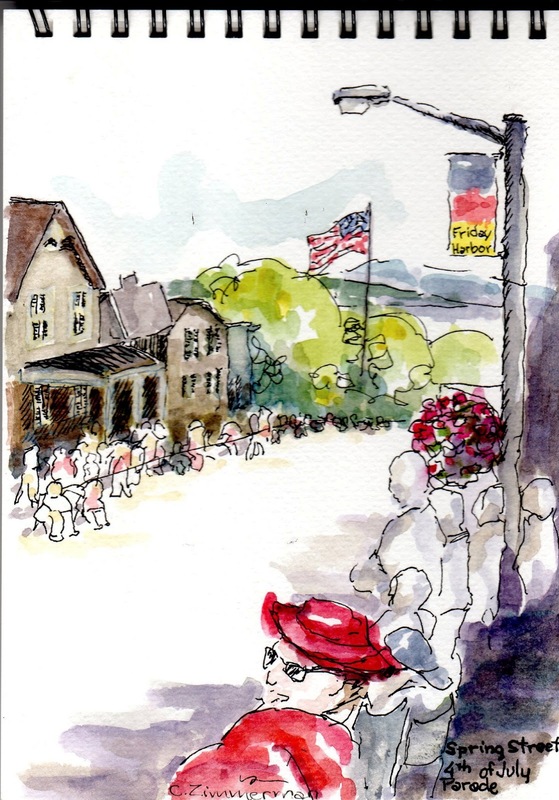 I loved the red hat and shawl worn by this woman, but it was a challenge to sketch on the crowded parade route! 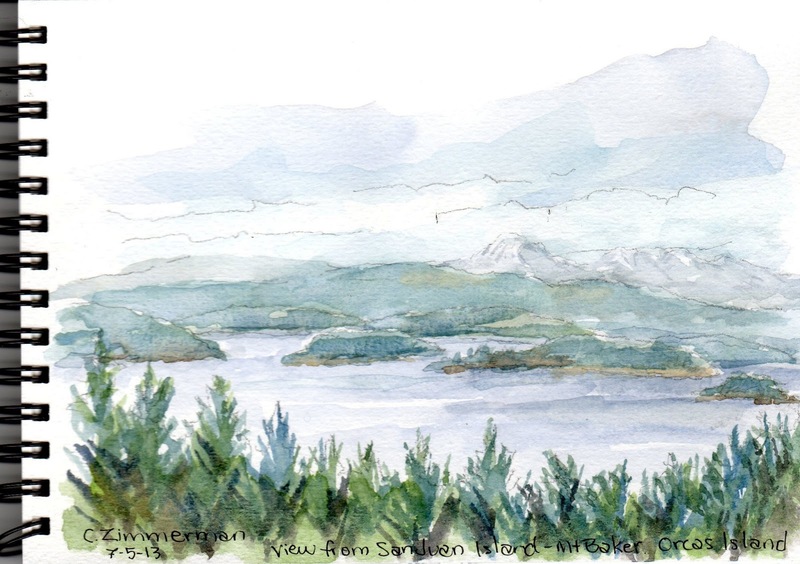 View of Mt.Baker, Orcas Island and Yellow Island from our friends' deck on the hill up from Roche Harbor Road. Challenging sketch done in Friday Harbor waiting for the 3:45pm sailing to Anacortes on July 6. 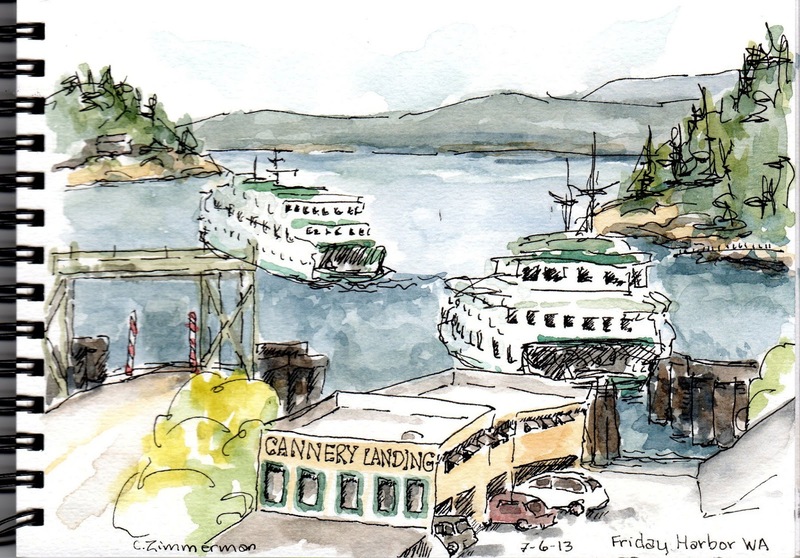 As two ferries left within minutes of each other, I was suddenly surrounded by a half dozen enthusiastic children wondering what I was painting and obstructing my view. They were so excited to tell me they knew primary colors and had learned some things in their art class. They forgot to turn around to see the view I was painting because they kept yelling out "What are you painting???" The mothers who were were acrylic painters appreciated the tip about wearing old sock bands on my left wrist as painting rags. This rewarding urban sketch moment was worth sacrificing perspective and sketching accuracy!! Carleen! Really great sketches! Love the composition and unique viewpoint on the Red Hat sketch, as well as the sketch with the two ferries leaving. Really challenging material, but you've done it well! Thanks Peggy! I keep hearing Frank in one ear and Gail in the other ear (from Line to Color workshop in Mt.Vernon. I tried moving for a better perspective, drawing my vertical line (the lamp post in the parade sketch) and using minimal color. But it is so easy to get distracted!